Selected for the Maryland Federation of Art's Strokes of Genius exhibition to be held from October 27 - November 25, 2017 at Circle Gallery in Annapolis, Maryland. 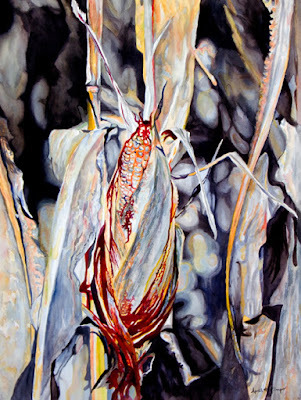 Stalks was one of 70 paintings selected for this National exhibition from a field of 512 entries. 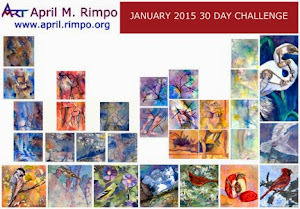 Such an honor to be selected by juror Susan Behrends Frank, Ph.D., Curator, The Phillips Collection, Washington, DC. Stalks was first inspired while walking past our neighbor's corn field. The cow corn was ready to harvest. 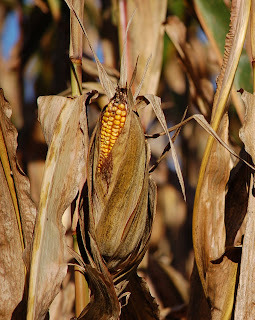 Everything, including the stalks and husks, had turned golden brown to beige. Ever fascinated with the world around me, I took a number of photographs. Upon arriving home I located a particular portion of one photograph that was especially enticing. 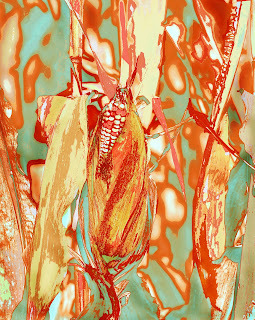 I like the shapes of the leaves and the glimpse of the corn inside. See the bottom left image for the cropped photograph that I decided to paint. As I often do after finding the image, I put the photo aside. I wasn't ready to paint this image yet. I generally have to think about a subject for a while to know what I want to do. I worked with the image some more in a photo editing program and experimented with a variety of color schemes. I thought I was going to go with a very exaggerated color scheme, turning the image more toward an abstracted shape, but had other paintings I wanted to complete first. I printed out the image in the color scheme shown below right. It sat on the desk in my studio so I could look at it and consider. After completing some color scheme experiments using a wide variety of palettes, I went back to the photograph and decided I wanted more value contrast. My selected colors could not achieve that level of contrast. It was back to the drawing board to determine what would be more exciting. I decided to create a primarily black and white painting with red for the darks in the focal point and yellow for the lights. I sprinkled the yellow around the painting, muting it in the background and allowing small less intense yellow patches to remain on other stalks in the foreground. I'm happy with the resulting drama of this painting. It seems to have elevated this cow corn to something fascinating to look at. As always I'd love to hear your thoughts. Love learning more about your process. It's stunning!